Making homemade jelly and homemade jam is a wonderful way to enjoy the flavor of fresh fruit year round. 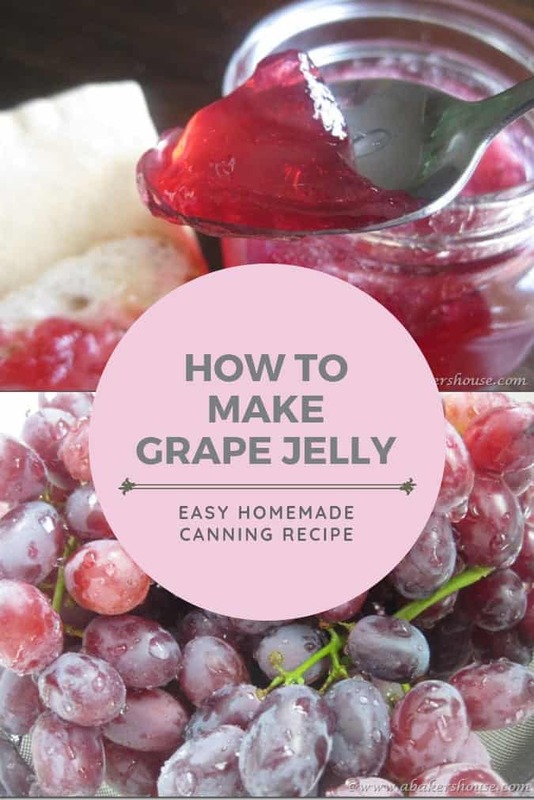 This grape jelly recipe is adapted from the directions on the Certo Liquid Fruit Pectin box so you can follow the same guidelines for many types of fruit jellies. 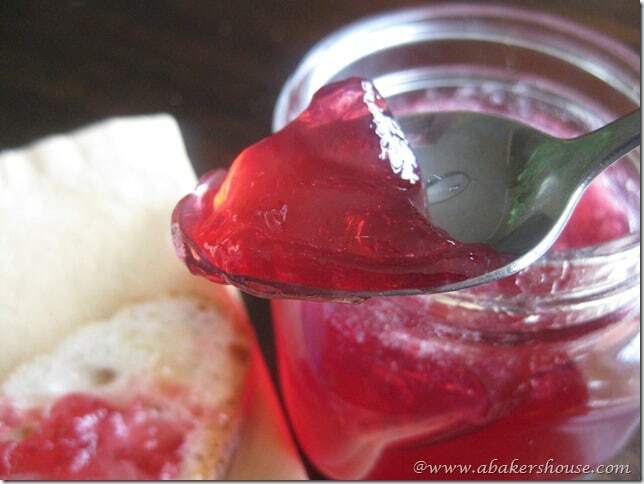 Grape jelly is a great way to save the taste of fresh grapes to enjoy later in a homemade jelly. There is something very satisfying about making jams and jellies at home. The colors of the jams seem brighter, the fruits fresher, and the tastes are all that much better than what you might buy off the grocery store shelf. The general difference between jelly and jam is that jelly is made from the juice of fruits and jam is made from the entire fruit. 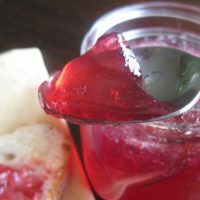 The distinctions are blurry in many recipes and you can often consider jam and jelly to be nearly the same. Here the grape jelly recipe starts with fresh grapes but then the juice is extracted from the grapes before you make the jelly. What ingredients are in grape jelly? How do you make grape jelly? On day one you will prepare the fruit. It will then sit out overnight. 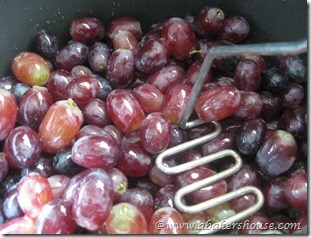 Strain the fruit to make your grape juice. Bring the juice to a boil in a large saucepan. Add the sugar. 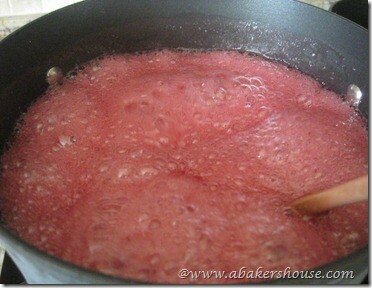 Add the liquid fruit pectin and bring the jelly to the gelling point. Ladle into sterile jars and process in a boiling water canner or store in the refrigerator. First mash the grapes with a potato masher. Add the small amount of water then bring to a boil on the stove top. 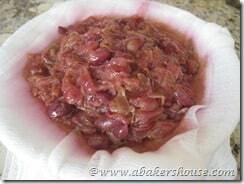 Use cheesecloth to strain the cooked grapes overnight. This step in making grape jelly allows you to capture the grape juice. You could skip this step and start with store bought grape juice and continue on to day 2 instructions. Use 4 cups of the grape juice (any extra? Drink it!) and add sugar. Bring mixture to a boil. Add the liquid pectin. Process with the boiling water canning method if desired. Or store in the refrigerator. This was my first attempt making grape jelly so let’s learn how to make grape jelly together and learn from my mistakes. At first I tried a recipe that didn’t call for extra pectin but I was unable to get the liquid to come together at the right consistency. 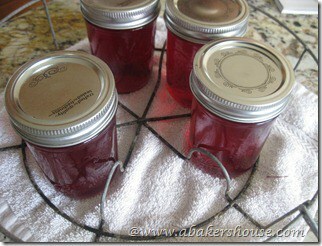 The addition of the Certo liquid pectin did the trick and resulted in a fantastic jelly. The process of making grape jelly is less intimidating than you might think. You add sugar and water (and sometimes pectin) to fruit, cook it, then ladle it into jars. Yes, I’ve left out a few details in between but overall this is not a tricky process. You can do it, give it a try! Once you have your beautiful grape jelly, use it in this recipe for Jam Sandwich Cookies. A thin layer of peanut butter would be a welcome addition too! Add a label to your jar of grape jelly! Access is free to my email subscribers. Join the growing number of email subscribers by using the form below. You’ll love this label for your homemade grape jelly! 1. 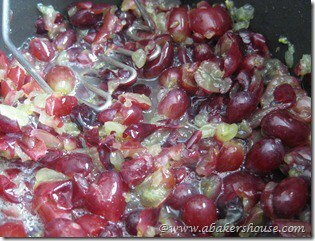 Take 3 lbs of grapes, remove the stems and crush the fruit. I used a potato masher for the crushing step. 2. Place the mixture in a deep saucepan (you’ll want the sides to be relatively high so the liquid doesn’t bubble over later in the process) and add 1/2 cup of water. 3. 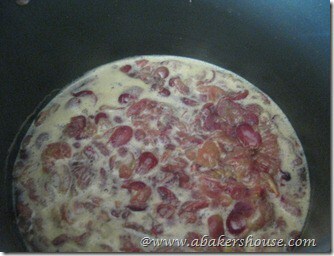 Bring to a boil then cover and reduce to a simmer for 10 minutes. 4. 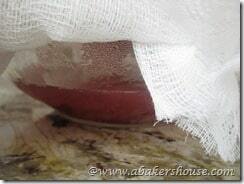 Prepare a few layers of cheesecloth by draping them over a bowl. Take the fruit and pour the contents over the cheesecloth. I let this sit overnight. Be sure that your cheesecloth is suspended high enough such that it doesn’t touch the liquid that has dripped through to the bowl. 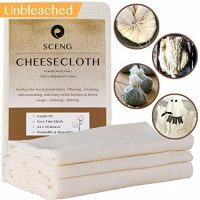 Don’t squeeze the cheesecloth or your juice will become cloudy. 2. Bring the juice and sugar to a boil and stir constantly. The mixture is going to start to rise up the sides of the pot. Keep stirring until you can’t feel the sugar scraping against the pot. The lack of that sugar sound means it is completely dissolved. 3. Stir in one pouch of the liquid pectin. Bring back to a full boil for exactly one minute—keep stirring! Remove the pot from the heat and try to skim off any foam that may be on top. 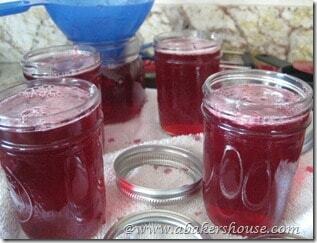 Ladle the jelly into sterile jars. If you plan to process with the boiling water canning method, have your sterilized jars and lids ready before you begin making jelly on day 2. If you wish to can the jelly proceed as follows, or, if not simply put the jelly in jars and leave in the refrigerator. Ladle the jelly into sterilized jars leaving 1/8 inch of space at the top. Clean any drips off of the rims then cover with the two-piece lids. Place the jars in a boiling-water canner and process for 10 minutes, or for as long as is required at your altitude. Remove the jars and allow to cool. The details of boiling-water canning are further explained in the Bell Blue Book of Preserving and also on the instructions included in the Certo Liquid Pectin packets. 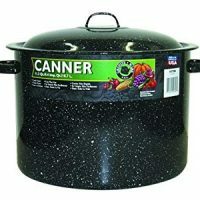 If this is your first time canning jelly please be sure to read more detailed directions before starting. 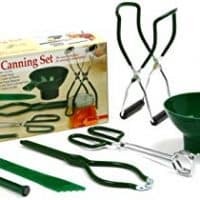 It helps to have all of your equipment sterilized and prepared ahead of time so that you can be one step ahead of the very hot and very bubbly boiling pots on your stovetop! Here are other jam, jelly and preserves recipes that you’ll love making homemade! This post was originally shared in 2012 and updated with text in 2019. Photos are still original to 2012. I didnt even know this was possible! Wow!! You are so good in the kitchen! So glad this brought back happy memories for you. Thanks for stopping by and leaving a comment. Have a great night! This is a great post! I’ve made tons of jams over the years but I have never tried a jelly. LOVE all the pictures…looks easy, just time consuming! Do you have a favorite jam to make? I like raspberry a lot. I hadn’t tried jellies before and this wasn’t too hard at all. just time consuming as it sat overnight but otherwise simple. Enjoy!